HIGH QUALITY - Soft synthetic leather. Tungsten steel color hardware. Detailed streamlined stiching. Full-lined coffee fabric lining. 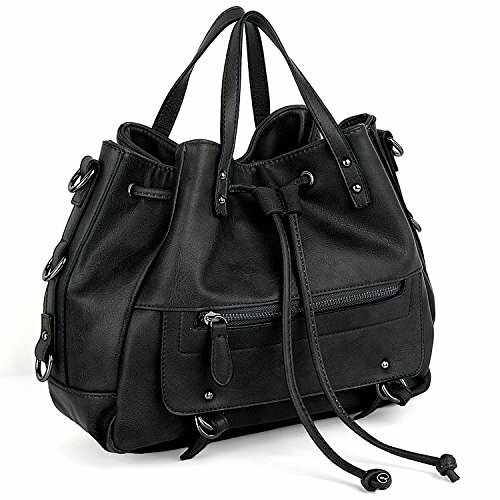 LARGE CAPACITY - Bag with zipper and drawstring closure. Interior: 2 slip side pockets and 1 side zipper pocket. Exterior: 1 back zipper pocket. MULTIPURPOSE - Handheld by 2 Handles. Crossbody Carried by 1 detachable/adjustable shoulder strap. DIMENSIONS - 12"L x 5.03"W x 9.84"H. Weight: 1.74 pounds. Removable and Adjustable Shoulder strap: 47.44". Handles drop: 4.52".